Hello again. 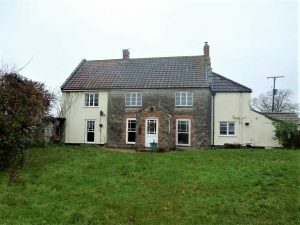 I thought I would talk a bit today about my business and how I started as well as telling you about what I have been doing this week. As I said, we were fairly remote. We were not on the school bus route therefore I had to drive my son to school and back every day. Due to those commitments and the long holidays for which I would have no child care, I did not work. I did volunteer work at a local horse rescue centre twice a week but that wasn’t enough to fill my days. 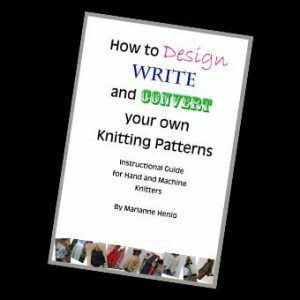 As I had been knitting for many years friends and family had often told me that I should be selling my work, so I decided to start my business. For my business name I wanted something short and catchy so decided on Casalana which comes from the Spanish words for house and wool, so I am known as Casalana the Woolhouse. 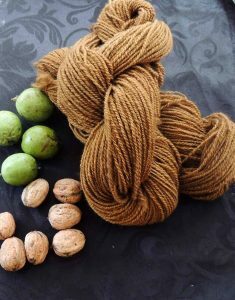 This week I have been dyeing with walnuts. I have had to be quick and collect them in before the squirrels took them all. I would like to say when foraging for materials, it is important to do this responsibly and only take a small amount from each source. There are many birds and small animals that rely on the many berries and nuts for a food source to get them through the winter. Walnut trees were introduced to Britain by the Romans. The English variety is known as the Persian Walnut as it originated from Persia and in ancient Persia they were reserved for royalty. The other variety is native to North America and is known as the black walnut. 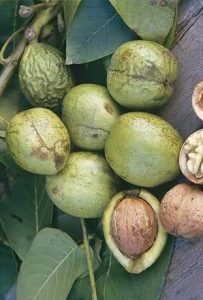 As you can see from the picture when the walnuts are grown on the trees they are encased in a green outer husk. When ripe this husk splits open to reveal the hard nut shell we all recognise which houses the delicious walnut inside. 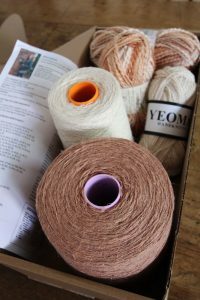 I use the green husks to dye and these usually produce a range of colours from a deep golden brown to a light fawn/beige. You can also use the pulverised bark and the leaves for dyeing. I also like to keep some of the nuts intact with the husk, shell and nut and soak these in a bucket. 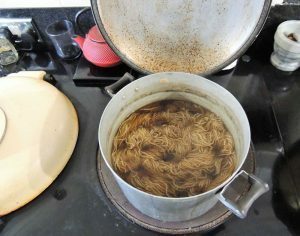 The water will gradually turn a darker and darker brown to almost black and they can be stored like this for many months and then used to produce a very dark brown to black dye. The key nowadays when selling products in what is effectively a saturated market is to stand out from the crowd in some way. If there are many others making and selling the same products as you then do it better! By that I do not necessarily mean make the product better. There are many other ways in which you can be better than your competitors. For example, have great customer service, get to know your clients, let them get to know you by opening up a little with a few personal touches, honour deadlines for delivery dates and try to make your produce unique in some way. I know there are many people out there that spin and dye their own yarns. How many can say that they buy only from local suppliers? That they visit the animals and know the names of the animal? That the product is organically produced and can trace that product from its source to the point of sale – I can. So that is one thing that makes my product unique and sets me apart from my competitors. This is fascinating Karen. And thankyou for your business tips this week. If you missed Karen’s blog post from last week then click here.